When I first played Mirror’s Edge back in 2008, I was really surprised at how much I enjoyed it. Despite the character, Faith, having no weapons except her fists and her speed, the first-person perspective of running on walls, sliding under pipes, and jumping across building gaps was exhilarating. Although the game was incredibly short and didn’t offer much else outside of the story, it was a solid and enjoyable experience. I looked forward to a sequel hoping they would add more content and build upon the foundation that they had already put forth. Who knew I would have to wait eight years though? 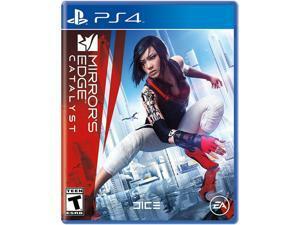 Fast forward to 2016, we finally have a follow-up, Mirror’s Edge Catalyst. 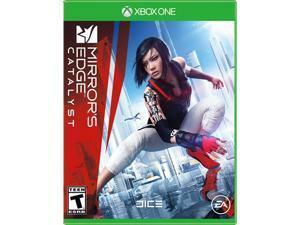 Catalyst, however, isn’t a direct sequel to Mirror’s Edge. It’s more of a prequel that takes us back to Faith during her teenage years and just starting out as a runner in the city of Glass. But does it live up to the hopes we had for a sequel? The game begins with Faith being released from a juvenile detention center. If players want to know what she did to get in there, EA is encouraging folks to grab the companion comic book Mirror’s Edge: Exordium, a 6-issue series from Dark Horse Comics. It’s not required reading for the game, but there is a history here that folks might find interesting as they play through the game. Once Faith is released she rejoins her old crew and starts trying to earn Scrip (the city’s currency) to try and repay old debts. On one mission to steal some info, she acquires a hard drive that unveils a conspiracy that sets up the story going forward. While the overall story and theme of the game is solid, the execution fell a bit short. Faith apparently has some deep relationships with some of the characters in the game, but I couldn’t feel it. So when something tragic happens to one of them, I was sort of like… “eh.” Even the storytelling during Faith’s flashbacks of her younger days lacked any emotional hook. Sure, it was interesting to learn more about the character, but the game really didn’t get me invested, which is disappointing. It’s unfortunate because there are some cool story elements in the game and some characters with potential, but everything felt so vanilla. Even the “twists” and “surprises” didn’t really do anything for me because you could see it coming from a mile away. What the game did get right is the gameplay. Basically, they didn’t change much in the foundation but added to it. The controls are tighter, more responsive, and smoother than the first game (I mean, why wouldn’t it be? It’s been eight years!). The running is faster and gives the game more intensity, especially when you’re being chased. Plus the hand-to-hand combat feels more powerful and impactful, especially when coming off a wall run and knocking an enemy out with a flying kick or punch. Some of the changes and additions in the gameplay include separate kick and punch actions (first game it was just one button for both), a Disrupt ability that acts as a momentary EMP or shock pulse, and a grappling hook that allows you to swing across gaps, pull yourself up the side of buildings, and pull down walls and barriers. The issue I had with the grappling hook, however, is you can’t grapple onto everything like Batman. There are only specific gaps, specific walls, and specific buildings that you can use the hook on. So if you accidently fall off the side of building or miscalculate a jump across a gap, there isn’t a quick launch of the hook to save you. While the city of Glass looks incredible and sticks with the aesthetic of the first game, I had a tough time figuring out where I was without using the map and using Runner Vision (the games GPS-like system) to find out where I needed to go next. With most open world games, there are identifiable landmarks or areas that you can pretty much use as a reference to tell you where you are. I’m thinking games like Grand Theft Auto V, Batman: Arkham Knight, or the Far Cry series, where there’s a sense of where you are in the game’s world. In Mirror’s Edge Catalyst, everything looks the same so it’s a bit more challenging to navigate without Runner’s Vision. The story missions in Mirror’s Edge Catalyst are only about 50 percent of the game. The rest of the game features a number of side missions and activities. Timed runs are basically races against the clock that are found throughout the world as well as timed runs created by users that you can race and see if you can beat the race’s creator. There’s also timed deliveries. While you’re running across roofs, you’ll run into different people who ask you to deliver a message or item to someone at another location and you only have a minute or more to get it done. 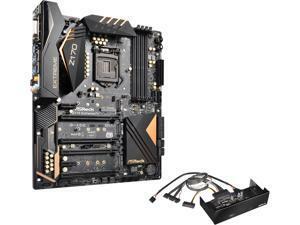 You’re also tasked with stealing chips from security consoles that are spread out across Glass along with finding items like audio recordings strewn about. The recordings are other people’s conversations about living in the city and their experience of dealing with the corporations and characters that are running things. My favorite side activity, however, was the unlocking of fast travel locations by hacking node grids. It’s a combination of a puzzle-solving and platforming. Most of the node grids require you to find a way up a tower to reach a console to hack the node. The way up the tower features movable platforms, bridges, and lasers that you need to navigate through in order to not fall to your death or set off an alarm that would call in the guards. This side activity was a nice break from being shot at and racing a clock and I wish this type of gameplay was incorporated a bit more into the main missions. When doing the main missions, side missions, and side activities, you earn XP, which earns you upgrade points. You use the upgrade point to purchase upgrades in skills like your movement, which improves your overall running with longer wall runs, slides, and rolls, along with some new moves like double wall runs. In the combat skill tree you can increase your health (which should be a priority), skills against specific enemies, and earn new moves. You can also use your upgrade points to upgrade gear like the grappling hook and Disruptor. You’ll need a lot of the skills in the progression trees to complete certain missions so sometimes they’re just given to you without needing to use an upgrade point. Overall, I feel like Mirror’s Edge Catalyst is a solid return to the franchise despite not having much of connection to the story and the gameplay not all the way forward as I would have hoped. There’s still some fun action, plenty of things to do, and a great world to look at and play in. 8.00 If you're a big fan of the first game, I'm sure you'll enjoy this one. However, if you never played the original, you might want to take a test drive first to see if you want to commit to it. The foundation of the Mirror’s Edge gameplay is intact and is smoother and faster. I just wish we could grapple hook any building or wall in the city. The city of Glass looks awesome! I just wish I knew where I was most of the time and had some sense of direction. I thought some of the story elements and characters were interesting and had potential, but for some reason I wasn't able to connect to it and didn’t care that much. After finishing the story missions, you can go back and collect all the items placed around the city, as well as run the timed races or create your own.